Some 80,000 people are trapped in a scrub land of hopelessness in a forgotten corner of the Middle East. Huddling in the wind, walled in by desert sandbanks, they have been driven there by war. Abandoned by governments, they are preyed on by the very ISIS gunmen and suicide bombers they fled their homelands to escape. NBC News was given unique access to the area where Rukban straddles a rocky, arid no man's land along the border linking Syria and Jordan — an important American ally, and a key member of the U.S.-led coalition against ISIS. Officially, it is located in a demilitarized zone. However, the pilot of the Jordanian military helicopter used during a recent NBC News visit wouldn't fly over it for fear of being shot down by ISIS cells in the camp. Brig. Gen. Sami Kafawin, commander of Jordan's army in the area, told NBC News that militants there "have whole weapons systems … small arms, RPGs, anti-aircraft." He added: "They consider the camp a safe haven. We consider it an imminent threat." President Donald Trump says he wants so-called "safe zones" to keep refugees in or near their own country even as they are displaced by war. 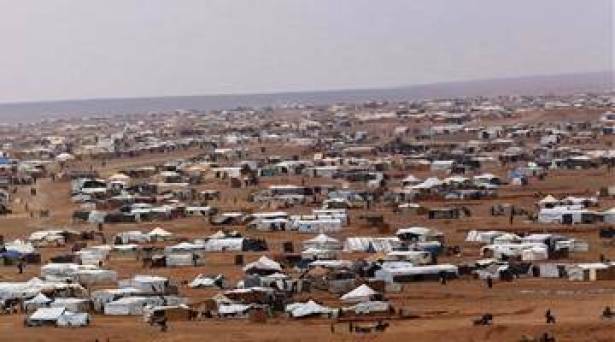 It is not clear whether Rukban is what he had in mind, but this makeshift refugee camp offers a stark lesson to those seeking to de-escalate the Syrian civil war and establish secure areas for civilians who've been driven from their homes. 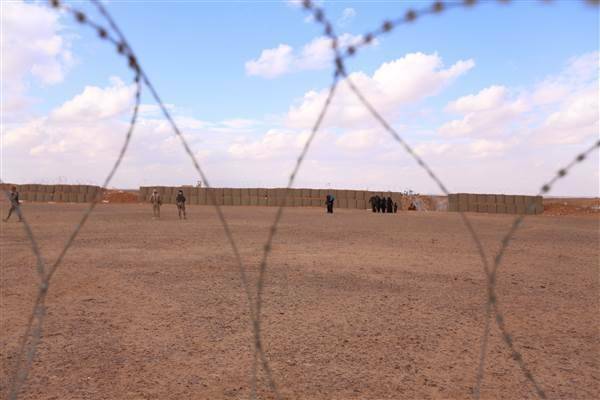 Syrians who left ISIS-held territory found themselves stranded at Rukban when Jordan closed its entire border with the country last year. The country has also blocked much humanitarian assistance from getting into the camp. Aid agencies have complained for months that they can't gain access the site to provide food and essential supplies. Coordinated by the U.N.'s World Food Program, a monthly delivery by a crane located in Jordanian territory makes up the bulk of what keeps men, women and children alive at the ever-growing camp. According to UNHCR, some 659,000 Syrian refugees and around 63,000 Iraqis have officially registered in Jordan — a country of about 9 million people. Citing the most recent census, state-run media last year reported that at least 1.26 million people in Jordan were Syrians. Now in its seventh year, the war in Syria has left an estimated 450,000 dead. Aid organizations believe that around half of Syria's population has been killed or forced to flee their homes in what is the world's worst humanitarian crisis since World War II. 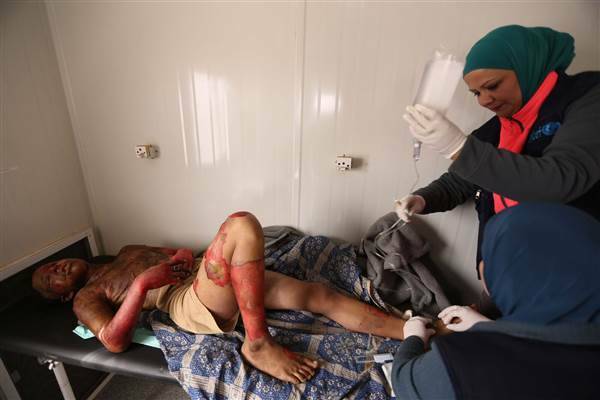 The sea of tattered tents, the barefoot women and begging children, along with the burn victims being treated nearby at Rukban are all proof that the desperate crisis is beyond the reach of aid workers. Last year, an ISIS suicide bomber killed seven Jordanian soldiers at a military base located less than a mile away. That resulted in Jordan preventing all but a handful of refugees from crossing its borders — and declared the area a "closed military zone." There have been regular attacks this year and daily gunbattles inside the camp, according to Kafawin. He estimates that up to five percent of its residents — about 4,000 people — may be militants. Syria's government lost control of this area years ago, and its border posts lie empty. Rebels opposed to the regime of President Bashar al-Assad control the neighboring region. Yet parties in the war continue to talk about making areas like this into safe zones. Trump ordered the Pentagon and State Department to examine how to make such "zones of security" actually safe. While the White House has not released information about the plans, it is clear that true safe zones would require lots of money, boots on the ground and planes in the air. Making such areas secure was also discussed when Trump met Jordan's King Abdullah on April 5. On Wednesday, Trump and Russian President Vladimir Putin discussed establishing such areas, according to the White House. And on Thursday, Iran, Russia and Turkey backed the establishment of safe zones in or around Syria — although the U.S. was not part of the agreement, and said it was concerned about Tehran's involvement. So clearly setting up safe zones would will not be an easy task. It "needs a lot of effort to do it, to maintain it, to secure it," Kafawin said. "It's difficult to protect. You need a no fly zone, you need 24-hour patrols and you need, for sure, ground forces." And who will provide all of that? "I don't think it's possible without U.S. support," he said. Trump already has a lot on his plate including escalating tensions with North Korea and Russia, and a worsening crisis in Afghanistan. Last month, he launched cruise missiles against a Syrian military airfield to try to prevent further attacks on civilians. Protecting tens of thousands of civilians with no-fly zones in camps like Rukban is a whole lot harder.